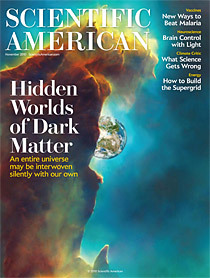 One of the things going on this week is a terrific cover story in Scientific American on dark matter by particle cosmologists Jonathan Feng and Mark Trodden. As every schoolgirl knows, particle cosmology is one of the most exciting areas of physics today; the convergence of the study of the extremely small (particle physics) and the study of the extremely large (cosmology) has had some spectacular successes in recent years. For example, the theory of cosmic inflation arose from considerations of particle physics, see post on inflation here. The article gives a great overview of the concept of dark matter, from a postulate in particle physics (Fermi’s beta decay – bit of a stretch here), to the postulate of dark matter in galaxy formation in the 1930s (Fritz Zwicki). Of course, the W and Z particles of ‘ordinary matter’ are now associated with the former, but it is thought that dark matter may play a role in their masses. Similarily, Zwicki’s proposal has now been extended to explain galaxy formation all scales, from galaxy clusters to halos. (Essentially, dark matter is thought to provide the inert scaffolding on which ordinary matter clustered to form galaxies during the expansion of the universe). The article goes on to describe the standard candidate for dark matter; hypothetical particles that feel only the gravitational and weak nuclear force (i.e. do not interact with the electromagnetic force, hence ‘dark’) they are known as known as weakly interacting massive particles or WIMPs. The authors do a great job of carefully describing the WIMP coincidence; the fact that the density of WIMPs postulated by particle physicists closely matches that postulated by cosmologists for the scaffolding necessary for the galaxy formation. The article also gives a useful overview of current searches for WIMPs in particle physics experiments. What is unusual about the piece is that the authors then go on to explain the newer concept of super-WIMPs; the idea that the original WIMPs may have decayed into particles that do not feel even the weak nuclear force. Thus is a fascinating idea and leaves open the possibility that such particles may interact with ‘dark forces’ we are completely unaware of. 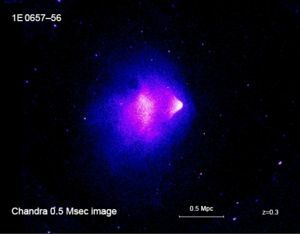 It’s a great overview, well worth reading – and unlike many such articles, it also includes a clear description of the famous bullet cluster i.e. the first tangible cosmological evidence for dark matter. Galaxy collision: x-rays (pink) are emitted when the interstellar gas clouds collide, while the dark matter (blue) remains aligned with distant stars because it is unreactive . The first comment below makes me realise that I should have mentioned the counter-argument. Some physics groups suggest that dark matter does not exist – instead our current understanding of gravity is incomplete. This is a perfectly respectable area of research, known as MOND; however, sophisticated experimental tests of our law of gravity (GR) have come out strongly in favour of the current theory..so far. Meanwhile, there have been tantalizing hints of particles that could be candidates for dark matter in at least two of the particle experiments mentioned in the article. What amuses me most Dr. O’Raifeartaigh is the growing number of “pictures” of dark matter that are appearing in science news and astronomy articles, and in scientific journals. What disturbs me about this practise is that these so-called pictures of dark matter are being presented as “scientific fact”. Pictures produced in computer simulations, PURE SPECULATION, but presented as factual science in the media. Dr. O’Raifeartaigh you even say above that its a “coincidence” that the WIMP density closely matches predicted quantities, like as if they are closing in on WIMPS being the true nature of dark matter. Lets be clear here, not a single WIMP has ever been detected. In underground mines, scientists are searching for dark matter candidates but not a single one has been detected. Next thing Nature journal and physics review letters will be publishing pictures of Alien’s and UFO’s and claiming they are real! Science needs a major correction to steer it away from its current direction. A fair point about the pics! ll wee see is a difference – and we interpret the red as X-ray emission from colliding gas clouds, and the blue as something that didn’t budge. Re coincidence, the point here is that it is not a given at all that the amount of DM required by the particle physicists fits with that of the cosmologists – it could have been orders of magnitude different. Re detection of DM direcly, that’s right, there are many experiments on this trail. However, these do not presuppose the existence of DM, they simply search for certain particles with certain properties. By contrast, your statement ‘Science needs a major correction to steer it away from its current direction’ seems to presuppose that DM doesn’t exist, whereas scientists like to leave this question open. I think Leonard Susskind sums it up very well when he says that there is nothing mysterious about Dark matter. In the end, once we find out what it is, we will all be able to say “Ohhh… so that’s what it was all along, its just another particle, or whatever it turns out to be”. But in the mean time, until we have verifiable evidence of the existence of some other heavy particle, or whatever, we must present all theories as being speculative and not fact. Every scientist and particle physicist knows the rough proportions of visible matter, dark matter and dark energy. So its no coincidence that they are trying to fill in the missing gap and there theories are in the ball park percentages. As a scientist, i am the doubting Thomas, the sceptic, until i have proof. To me, this is more important than seeing a computer generated graphic of what dark matter might look like. Hmmmmm…… Well lets just think about that for a minute! For the last 50 years we have been taking pictures of colliding galaxies, there are thousands of them. Its commonly accepted that as they smash through each other, little or none of the stars and real matter actually collide because of the massive distances between the normal matter. So over a billion years, they merge to form one big galaxy. Gravity pulled the whole lot together as we would expect. The conundrum – If all the matter and stars we see as the galaxy’s collide acts as we expect then why would dark matter just keep on going? Why would the dark matter travel further out to the edges of the collision on the first pass? Keep in mind that almost none of the normal matter collides? To me this would imply that the dark matter has less of a gravitational effect than the normal matter. Or that the guy simulating what he thinks this imaginary matter might look like made a mistake. If there is about 7 times more dark matter, then the dark matter should stay closer to the middle of the collision. Of course it’s true that the stars themselves don’t collide…but the gas clouds, formed of baryonic matter, do interact i.e. the hot gas of the two colliding components, seen in X-rays, represents most of the mass of the ordinary (baryonic) matter in the cluster pair. The gases interact electromagnetically, causing the gases of both clusters to slow much more than the stars….and much more than the dark matter. Well no doubt this topic will give scientists something to debate about for many long years to come. Science would be no fun if we had all the answers. Thank you Dr. O’Raifeartaigh. Just for the record Dr. O’Raifeartaigh, on the topic of Dark Matter, i still stand by my own personal view that its not a particle at all. I still stand by my own personal theory that Dark Matter is Electromagnetic Radiation in transit. Its an effect that science has not picked up on to date, nobody is even researching the idea, thats why Dark Matter is so illusive, everyone just dismisses electromagnetic radiation as having a zero mass value, which it does NOT!. It has all the properties of mass because its travelling! Whats the simple proof i’m right??? – Ask any astronomer studying dark matter/dark energy how EXACTLY they are accounting for mass that has been converted to electromagnetic energy in the last 13.7 billion years???? – I bet you a Euro they will tell you its negligible so they leave it out of calculations. I bet you another Euro they won’t be able to give you even a close estimate of how much mass has been converted to energy since the big bang!! Astronomers measure the speed of moving galaxy’s by measuring electromagnetic radiation. Yet they discount its effects in their calculations. But Dr. O’Raifeartaigh will i let you in on a secret. Do you want to hear about a funny coincidence? The figure comes out at close to 90%. About 25% of that occurred in the last 13 billion years, the rest in the first 700 million years.